Do you eat enough veggies? Dietary guidelines recommend that we get at least five servings of vegetables every day. But if you're like many dieters, you have to force yourself to eat them. That is, until now. Starting today, you can make vegetables taste better and to learn how to enjoy the foods that are good for you. Believe it or not, there are healthy ways to add delicious flavor to veggies that don't involve melted cheese and ranch dressing. Of course, there is nothing wrong with melted cheese or ranch dressing, but both of those methods will add fat and calories to your meal. Try one of these sneaky tricks instead. You might not like vegetables because you haven't found the variety that fits your taste. If your experience with veggies is limited to your mother's intolerable Brussels sprouts casserole, then it is time to branch out. Visit your local farmer's market and investigate new flavors. Speak to local growers and find out which vegetables are in season. You'll get the best flavor from foods that are grown locally and picked fresh. If there is no farmer's market in your area, talk to the produce manager at your local grocery store. These veggie pros are happy to share buying tips and preparation ideas that can make vegetables taste better. Many grocery stores also provide recipe cards with new ideas for cooking. It's hard to enjoy veggies when they are steamed or boiled. Many vegetables turn out mushy and bland when they are prepared that way. So why not try new cooking methods to spice up the taste? Some savvy cooks are using an air fryer to get the delicious crunchy taste of fried food without the fat and calories. Or you might try roasting or grilling vegetables to get a smoky flavor. You can also learn how to saute vegetables in butter, olive oil, or wine to make them taste better. Or if you prefer to keep the calorie count lower, you can saute veggies in chicken stock. The vegetables take on the flavor of the stock so they taste better. So which vegetable is best for sauteing? You can saute almost any veggie, but leafy greens are especially good. Try kale, mustard greens, or chard. Sprinkle a small amount of Parmesan cheese or Manchego cheese on top of the finished dish to add flavor. You can also cover up the taste of vegetables if you can't stomach the taste. Think about the foods that you enjoy. What seasonings are used to prepare them? You can use those spices and seasonings to make vegetables taste better. For example, do you crave tacos and nachos? Then sprinkle cumin, cayenne, or Tabasco on sliced zucchini or yellow squash, and roast the veggies for a Mexican-style side dish. Do you favor French food? Chop fresh herbs such as tarragon and toss with a teaspoon of olive oil. Brush lightly on asparagus and roast. If you prefer Indian food, sprinkle curry on eggplant or another soft vegetable and grill or roast. 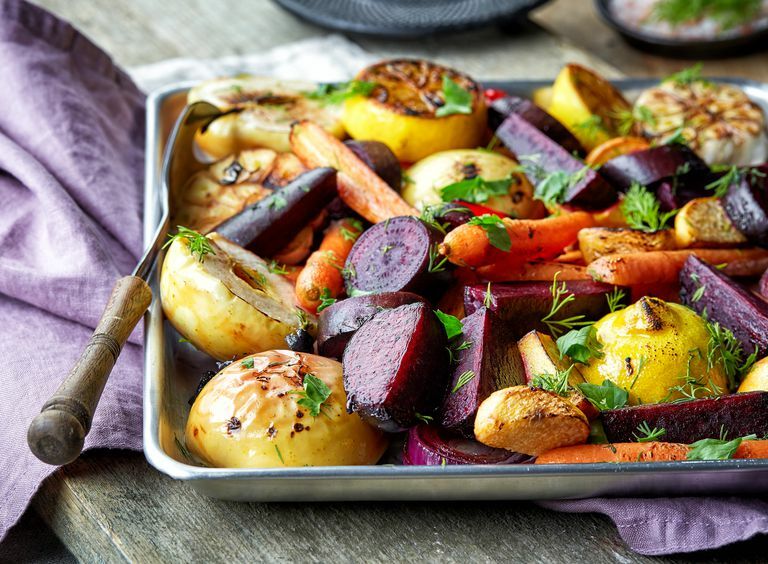 When you roast vegetables with herbs and seasonings, the spice flavor becomes stronger. Try this basic technique for roasted asparagus. The same technique can be used with other veggies as well. Try one of the seasoning blends above or experiment with flavors from another food region. If all else fails and you simply can't tolerate the taste of vegetables, try hiding them. It's one of my favorite ways to make vegetables taste better. For example, you can chop steamed broccoli into small pieces and add them to low-fat turkey meatloaf. The blended seasonings in the loaf will cover up the taste of the broccoli, and you'll get one or two servings worth of vegetables inside a hearty lean meal. And did you know that you can make a pizza crust out of cauliflower? It really works and tastes good too. Top your pizza with your favorite sauce, cheese, and meat and you'll never know you're eating veggies. You can also add vegetables to your favorite sweet smoothie recipe and you'll never know that they are there. For example, when carrots are added to a strawberry or raspberry smoothie they add sweetness and color. And this green smoothie recipe (near the end of the article) ​contains a healthy dose of spinach and you can't even taste the vegetable. And lastly, soup recipes are a great way to eat more vegetables. Many creamy soup recipes include vegetables like cauliflower for texture. Before you know it you'll be a veggie pro. What Is the Smoothie Diet?